What is elder abuse, exploitation, isolation and neglect ? Elder abuse can be physical or mental abuse of a senior, isolating a senior from having contact with other people or stealing their property through various means. It also includes a caregiver who does not provide proper care to a frail senior or a senior who is not taking proper care of themselves. What should I do if I suspect someone is abusing or exploiting an elderly friend? If you suspect that the abuse is occurring in a private home or a long-term care facility, call Elder Protective Services at Nevada Division for Aging Services (775-688-2964) or call local law enforcement. Am I required to report suspected elder abuse? Yes, if you have assumed the responsibility – with or without pay – for taking care of an elderly person. Other mandated reporters include: Any person who maintains or is employed by an agency to provide personal care services in the home, any employee of a law enforcement agency, physicians, dentists, optometrist, medical examiners, nurses, athletic trainers, ambulance drivers, social workers, and generally anyone who examines, attends or treats an older person who appears to have been abused, neglected, exploited or isolated. Financial institution employees are also required to report any suspected financial abuse of an elder as well. If an older person is in immediate danger, the local police, sheriff’s office or emergency medical service should be contacted. Is there anyone who will check on my elderly parent’s well-being for me? Yes. If you are worried that something has happened to a parent or elderly loved one who lives in a different community, you can contact the local law enforcement agency in his or her community and request a well-being check. What will happen if someone finds out that my grown child is hurting me? It depends on the abuse. But if you are mistreated in any way, you need help. And your child needs help as well. Call your local Division for Aging Services office and report the abuse. 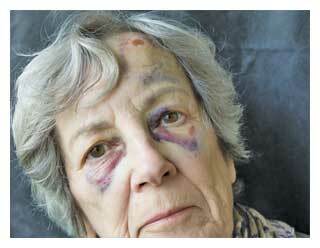 An Elder Protective Services Social Worker will begin an investigation and will help you become safe from the abuse. What can I do to protect myself from an abusive caregiver or spouse? If you are in immediate danger, call 911. When the police arrive explain what happened. The officers can contact an on-call judicial officer and issue you a Temporary Order for protection against domestic violence. This type of order is available to a victim of domestic violence/elder abuse 24 hours a day 7 days a week in a county whose population is 47,000 or more. (Most other counties in Nevada offer the same or similar services) This legally prohibits the abuser from coming near you. If your situation is not an emergency, you may go to the courthouse during working hours to fill out the necessary forms to receive a protective order. A temporary order expires in such time, not to exceed 30 days, as the court fixes. An extended order for protection expires within such time, not to exceed 1 year, as the court fixes. But while a restraining order may help protect you, be aware that it does not eliminate the risk of future violence. To locate a local shelter or counseling,call law enforcement or the National Domestic Violence 24-hour hotline at 1-800-799-7233 or the National Center on Elder Abuse at 1-(202) 898- 2586. What if my rights are being violated in a long-term care facility? When you check into the facility, you must receive a printed copy of the Resident’s Bill of Rights. If you or your family members think that any of those rights are being violated, you can call the Long Term Care Ombudsman at the regional Division for Aging Services office. The Ombudsman will talk to you to get the facts, and will advocate for you to resolve the issue. Every facility is required to have a poster in a conspicuous space that shows the Ombudsman’s telephone number.